A clause is a grammatical unit of meaning containing, at minimum, a subject and verb. 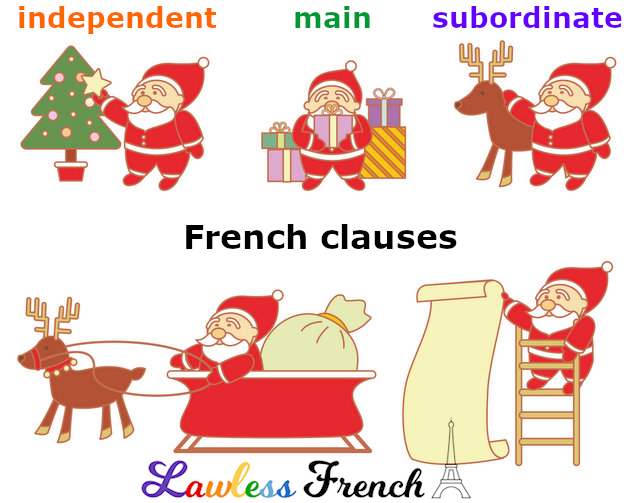 There are three different types of clauses. An independent clause stands alone: it is either a complete sentence or is attached to another independent clause with a coordinating conjunction. As the name indicates, independent clauses, highlighted here in orange, are not dependent upon other clauses, and no other clauses are dependent upon them. Je suis parti. I left. Il aime le gâteau. He likes cake. Le livre est sur la table. The book is on the table. Je n’ai pas mangé et j’ai faim. I haven’t eaten and I’m hungry. Elle est prête donc on peut commencer. She’s ready so we can start. A main clause is similar to an independent clause: normally it could stand alone, but there’s a subordinating conjunction or relative pronoun attaching it to a subordinate clause. If you say just the green part, you still have a grammatically correct sentence, but the additional meaning or clarification provided by the subordinate clause is missing. Je suis parti quand il a appelé. I left when he called. Il aime le gâteau que tu as acheté. He likes the cake that you bought. Le livre que tu m’as prêté est sur la table. The book you loaned me is on the table. J’ai faim parce que je n’ai pas mangé. I’m hungry because I haven’t eaten. Si elle est prête, on peut commencer. If she’s ready, we can begin. A subordinate clause, also called a dependent clause, is just the opposite: it can’t stand alone because it begins with a subordinating conjunction or relative pronoun that attaches it to a main clause. If you say just the purple part, you can immediately tell that essential grammar and information, contained in the main clause, are missing. Subcategory: When a subordinate clause begins with a relative pronoun, it is also known as a relative clause. Previous On peut se tutoyer ?